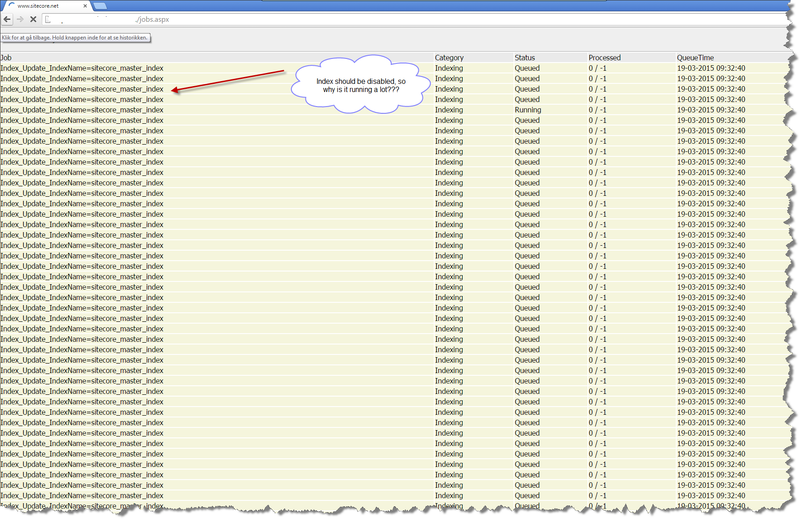 Sitecore 7 – Disable indexing – It is not enough to set Indexing.UpdateInterval to 00:00:00. I was working on a setup for a customer where they have a dedicated publish server and therefore it was not necessary to update the indexes. There are many post stating that to disable sitecore indexing you have to set the Indexing.UpdateInterval setting to 00:00:00 i.e. The website has been recently upgraded from 6.6 to 7.5 and I noticed that the indexes were still being built? So I used Brian’s jobs page (see his blog) which listed all the running jobs to see what was running and to my shock there were a lot of index update jobs? Which meant that instead of using all the machines power to publish it was busy indexing ALL the time? But since Sitecore 7.0 there is an extra setting which has to be changed in order to disable indexing. To disable indexing the BucketConfiguration.ItemBucketsEnabled setting also must be set to false in the Sitecore.Buckets.config i.e. This entry was posted in Indexing, Sitecore 7.5 and tagged Indexing, Lucene, Sitecore on March 19, 2015 by Alan Coates. By default an agent is set up which optimizes the sitecore_master_index once per hour. It checks whether or not item buckets are enabled, and if they aren’t the index optimization isn’t run. The class is called Sitecore.ContentSearch.Tasks.Optimize. Thank you for sharing your knowledge. I’m just wondering if it’s a “documented feature” that master index is not required for correct publish process. Actually, we are using the same approach – we have separate publish instances where we are not indexing. Anyway, we have disabled indexing by complete index removal on configuration level ( has been removed on publish instances). I’d have another question … Are you using buckets on your site? And if so, does it publish correctly bucketed items if it’s disabled for publish instance? We do not copy in the index, as no one searches or uses the master index on the publishing server it is only for publishing. We have not noticed any problem with this (apart from parts of the front end will not work as we use the index to find related content, but this is not an issue as the customer does not expect and or have access to browse the site using the publishing instance. I hope this answers you question? Yes, sure. Thank you very much! Then again we have upgraded to 7.5 update 2, and now it appears that publishing is failing, due to using ALL memory 28GB and some items don’t get published. But saying that sitecore own include files for publish optimization disable indexing!